The Best Virtualization Blogs from thousands of Virtualization blogs on the web using search and social metrics. Subscribe to these websites because they are actively working to educate, inspire, and empower their readers with frequent updates and high-quality information. Virtualization newsletter is a comprehensive summary of the day's most important blog posts and news articles from the best Virtualization websites on the web, and delivered to your email inbox each morning. To subscribe, simply provide us with your email address. Denver, CO, USA About Blog The weblog of an IT pro specializing in virtualization, networking, cloud, servers, & Macs. Facebook fans n/a. Twitter followers 26,072. The Netherlands About Blog Eric Sloof has been working in the information technology for nearly 20 years and shows comprehensive knowledge and expertise in virtualized environments, storage and networking. Facebook fans n/a. Twitter followers 12,694. Nederland About Blog The Weblog on virtualization and all things related. Facebook fans 4,124. Twitter followers 2,817. Phoenix, AZ About Blog This site provides the latest news, reviews, guides, and tools covering Application Virtualization, EMM, VDI, Desktop Virtualization, Citrix, VMware, BriForum and more. The Netherlands About Blog A blog about virtualization, data center, security, end user computing, IoT and cloud. Facebook fans 88. Twitter followers 1,951. San Francisco, CA About Blog Virtualization is transforming computing, from the datacenter to the desktop. News, comparisons, bugs, assistance, migration, anything: we're here to talk about it. P2V the world! Facebook fans 1,227,976. Twitter followers 593,203. The Netherlands About Blog Yellow Bricks is a personal Blog about virtualization(mostly VMware related) maintained by Duncan Epping. Facebook fans 3,255. Twitter followers 31,221. Milan, Italy About Blog Technical blog focused on Virtualization, Active Directory and Networking. Facebook fans 199. Twitter followers 867. TX About Blog A blog Providing Consulting for all your Cloud, Security, and Virtualization Needs. Frankfurt About Blog All about VMware, Cloud, Virtualization, Management and Hardware. Facebook fans 3,773. Twitter followers 1,101. United States About Blog Vembu is a leading provider of affordable software and cloud services with an array of innovative, flexible and reliable solutions for data protection, disaster recovery and CRM. Vembus flagship offering is its Backup & Disaster Recovery (BDR) product targeted at IT-Administrators in small and medium businesses to protect their Physical, VMware and Hyper-V environments. Facebook fans 4,290. Twitter followers 2,098. San Diego, CA About Blog This is a personal blog by Derek Seaman, a Top 25 Virtualization Blogger, which focuses on enterprise IT technologies such as Nutanix, VMware Virtualization, datacenter hardware, and Microsoft enterprise software like Windows Server. Delhi About Blog Virtualization24x7.blogspot.com is the personal blog of Ranjna Aggarwal and has a strong focus on Virtualization Technology. Facebook fans 2,198. Twitter followers 474. London About Blog Tom Fojta's Blog is all about virtualization, cloud computing and beyond. NJ About Blog Alex López is a VMware Solutions Engineer by profession, a VCA-DCV, VCA6-DCV, VCP5-DCV, VCP6-DCV certification holder, and a proud honoree of the awarded and well-respected VMware vExpert 2016, 2017, & 2018 title! Palo Alto, CA About Blog Denodo is the leader in data virtualization providing agile, high performance data integration and data abstraction software at half the cost of traditional approaches. Facebook fans 332. Twitter followers 4,361. Koedood, Netherlands About Blog Paul Grevink is an IT Consultant. He is especially interested in subjects concerning Cloud, Virtualization, storage and networking. Paul is specialized in VMware Products, but also has an extended knowledge of Microsoft Windows, Linux and other Open Source products. New Delhi(India) About Blog A blog about VMware Virtualization, Cloud, Business Continuity, Disaster Recovery and NVIDIA GRID GPU. Facebook fans 658. Twitter followers 821. California About Blog The ITVCE (Information Technology Virtualization and Cloud Enthusiasts) blog is a community driven site for IT Professionals. The content found on ITVCE.com is primarily geared toward community support and enablement for application, desktop, and server virtualization technologies. Facebook fans n/a. Twitter followers 3,489. Facebook fans 1,298. Twitter followers 999. Facebook fans 96. Twitter followers 34. About Blog Virt Tools are open source virtualization management tools for Linux system administrators. This site provides tutorials, videos, documentation, online help and roadmaps to help you get started with and understand the tools. Los Angeles, CA About Blog Virtual Remote provides cross-platform Mobil Apps,Virtual Servers/Applications,Data Center and Coding solutions. Setting higher standards for VOIP , Cloud technology & Virtual Servers and investing in to highly skilled team for the implementation of customized solutions for clients. UK About Blog News & views from the virtualization and tech space by Jane Rimmer. Facebook fans n/a. Twitter followers 3,858. Leeds, England About Blog shuttleTITAN is a personal blog about virtualization (primarily focusing on VMware products and suites) maintained by Varun Vermani. Canada About Blog This blog covers Virtualization and Cloud Computing with emphasis on VMware products including vSphere, VMware ESXi/ESX, vCloud Director, & vCloud Automation Center. 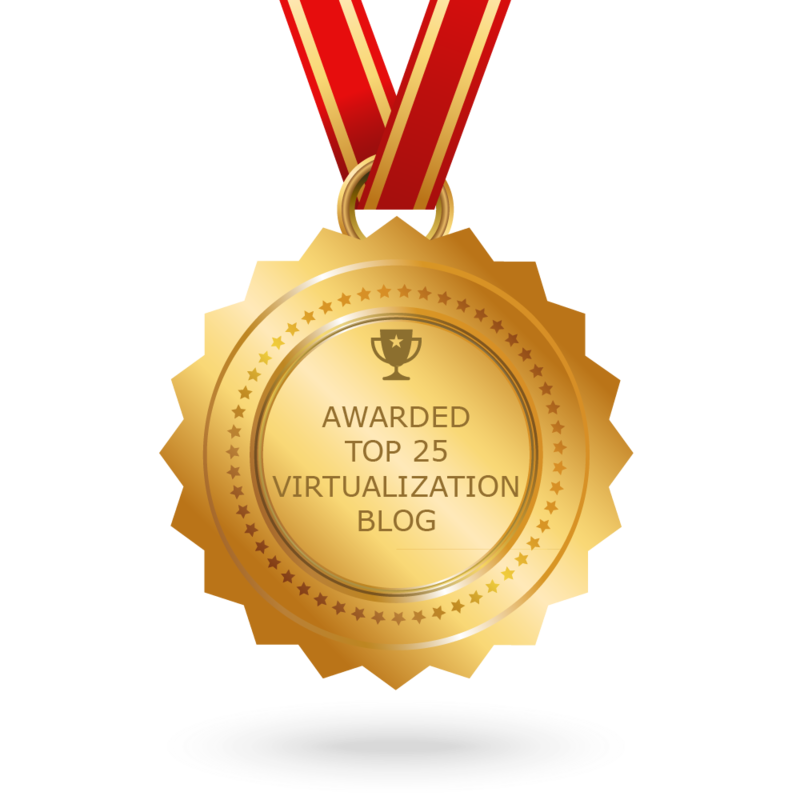 CONGRATULATIONS to every blogger that has made this Top Virtualization Blogs list! This is the most comprehensive list of best Virtualization blogs on the internet and I’m honoured to have you as part of this! I personally give you a high-five and want to thank you for your contribution to this world.